Did you hear it yet? 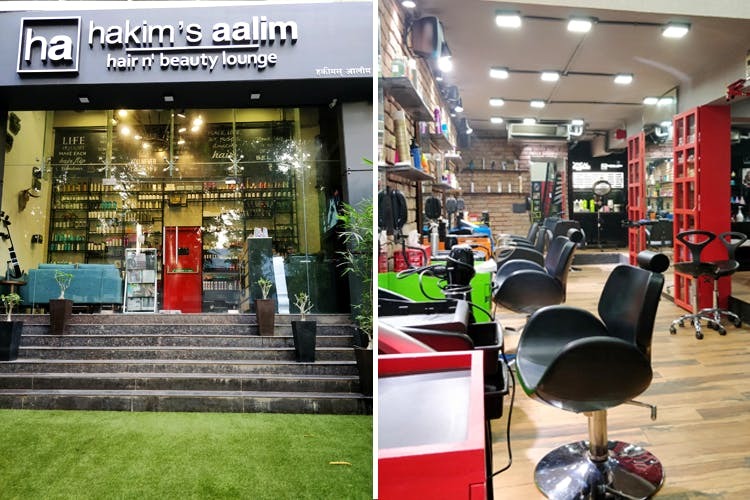 Celebrity hairstylist, Aalim Hakim has opened up his luxury hair lounge, first time in Pune, at Kalyani Nagar. Located opposite to Kalyani Bungalow, Aalim Hakim’s Hair n’ Beauty Lounge is all about pampering yourself like a celeb, in utmost luxury. Here’s the first look of this amazing salon. As you enter this place, you know you’re in for the best. The interiors are bustling with colors; the lounge area adorns a sophisticated shade of velvety blue for the sofas and a sea-green magic for the walls. There quirky little knick-knacks on the walls, including erstwhile cameras, an ox head, Murphy radios and what looks like B&W television set from the early 80s. A corner of the wall is dedicated to an array of skin and hair care products. The two-storey building is a mix-and-match of earthen tones and vibrant hues. The well-polished wooden flooring matches the bricked walls, that in turn, compliments the bright colors of the furniture. Check out the Aalim Hakim great wall of fame, boasting of his photographs with B-town stars, in neon-black frames. The staircase leads you to the skin and body care area which is dedicated to mani-pedi, nails, waxing, threading, facials, massages and more. What’s more? There’s a live DJ console out here! Ever seen that before? Now, coming to the services. Needless to say, but Hakim’s Aalim lounge includes everything, right from your hair to the tip of your toe nail. And, the prices range between moderate to sky-high. For a normal haircut done by a trainee stylist, you might end up shelling a good INR 1,500 to INR 2,500. For fancier cuts and styling by a senior, it may cost you between INR 3,500 and INR 5,000 or more. Similarly with hair colouring, the price starts from INR 6,500 and goes up depending on your length, style and the products. Get those Alia soft curls or the Ranveer Singh handsome hunk cut at Hakim’s Aalim hair lounge.